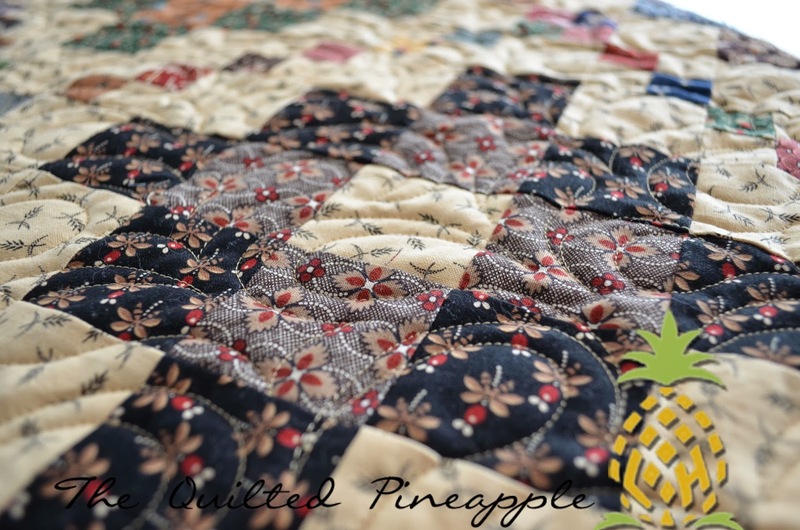 THE QUILTED PINEAPPLE: Clover Schnibbles Quilted! When I want to see pretty things I always come here. :o) At times I want to leave those character flaws -- sometimes I do and sometimes it's like hair on the bathroom floor. :o) Congratulations to Lisa. I hope she enjoys making corduroy creations. 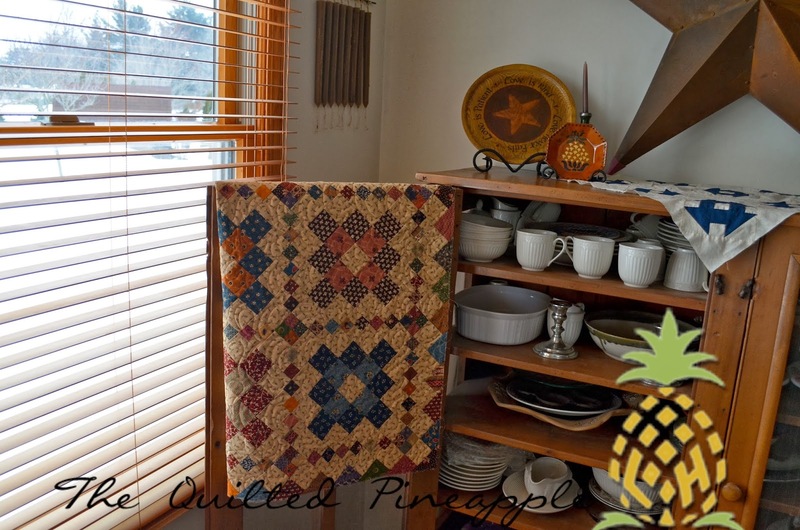 The quilt looks beautiful on the wall, nice thing to have when piecing, I am always getting lost as to where i am in a quilt. 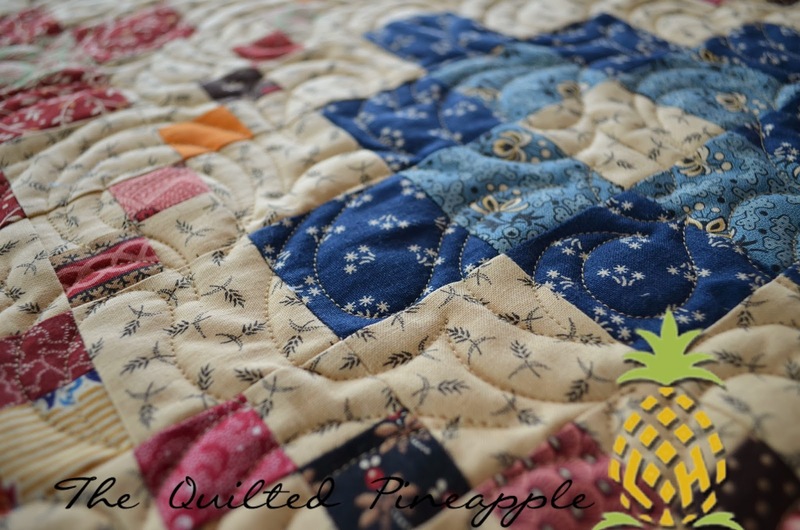 This is SUCH a pretty little quilt--the pattern, fabrics, quilting--everything! It sings! And I love the splash of cheddar in there! Beautiful Clover~! I ripped out a couple squares on mine, too. 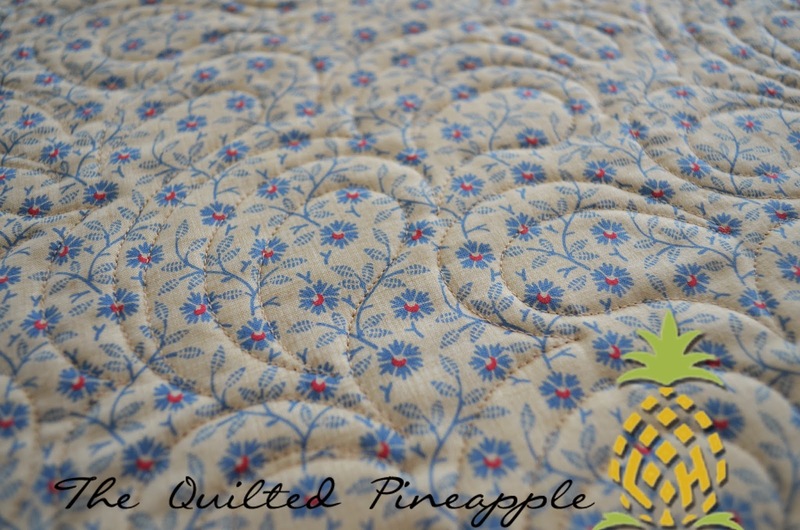 Your quilting is always sooo gorgeous. 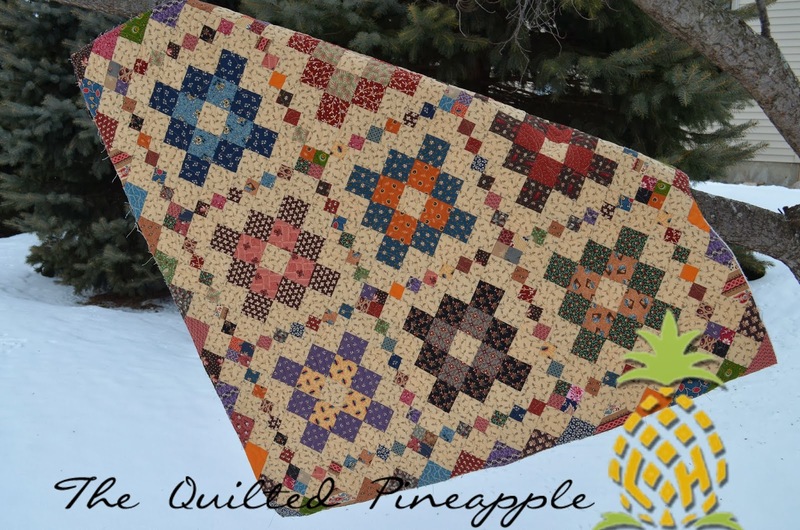 Clover is a classic and cozy scrap quilt. I need a proper design wall instead of a flannel-backed tablecloth. Yours looks so neat and tidy. Thanks for mentioning where you purchased flannel. get lots of enjoyment out of that! Can I ask you what your background fabric is? Lovely. 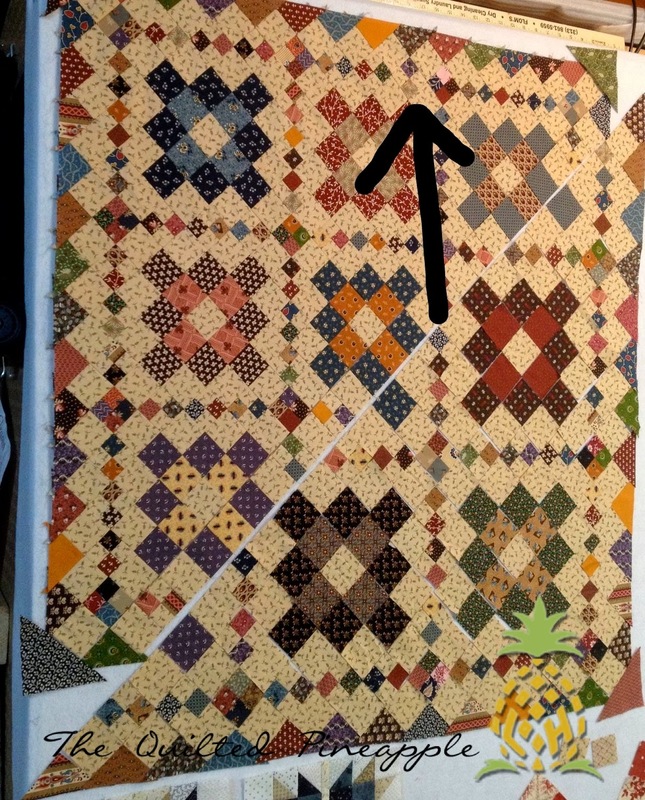 I had the same problem with laying out my quilts on the floor and then never getting the time to do "my" quilts. I then learned about webbing the quilt. Oh happy day. See a mistake ? Easy peasy. Just clip 2 seams and two webs and fixed. That's so funny you are wishing for summer and I'm dreading it. Summers in AZ, not fun. 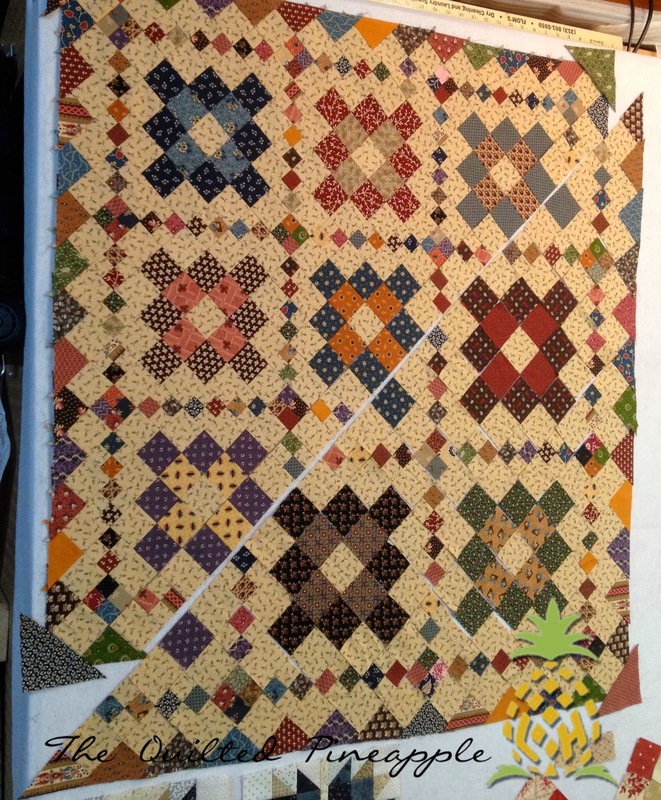 I never made the Clover quilt. Knew it had to be laid out in a big enough place and the name Clover meaning much ripping out needed to be done scared me. So you use the batting scraps, too! cool! 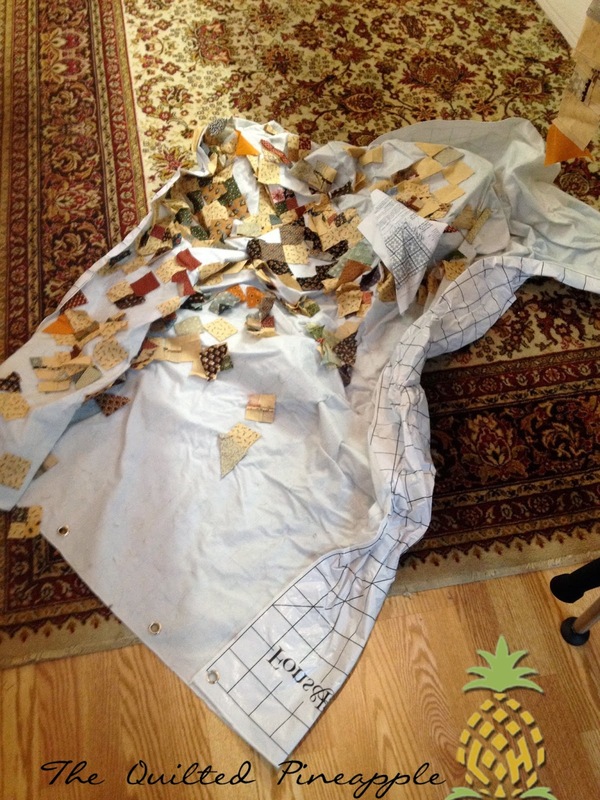 Do you sew them together, use the iron on batting tape, or just lay them together? This is my favorite Schnibbles EVER. Your fabric choices could not have been better. Great job! Very nice Linda! Definitely a good one for a design wall! That Schnibbles is so you, Linda! Your little oopsy just adds to the character for sure! I know you'll love your design wall as much as I love mine! I have to laugh - Gracie May and Sasha would have dragged those little pieces of the quilt all over the house! BTW - you have great taste in carpet - that is exactly the carpet we have! 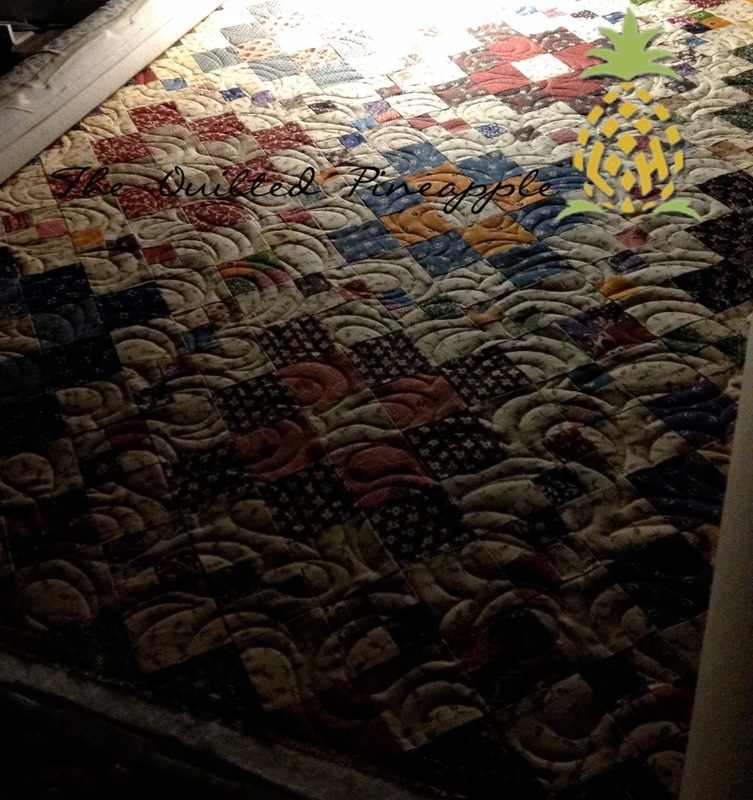 I emailed you my address if you didn't receive it email me at traditionalquilter@gmail.com. Thank you so much for the book. 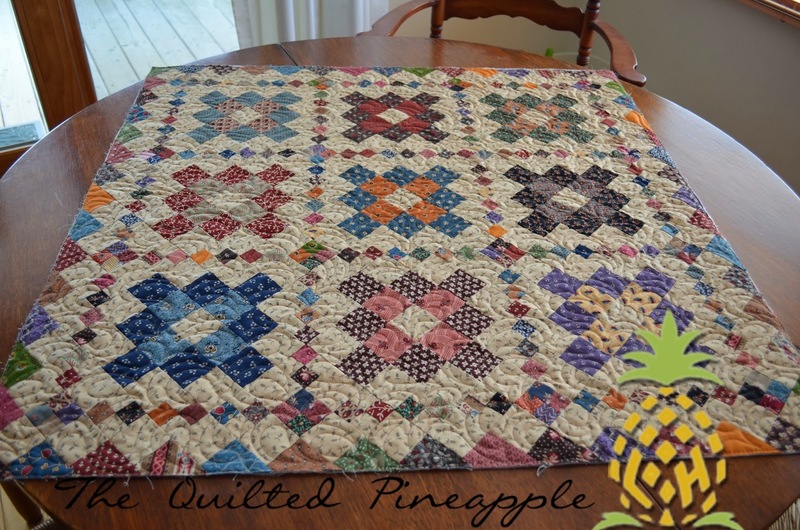 I am happy to have won it and I will be making a corduroy quilt from the book this year. I can't wait to get it. 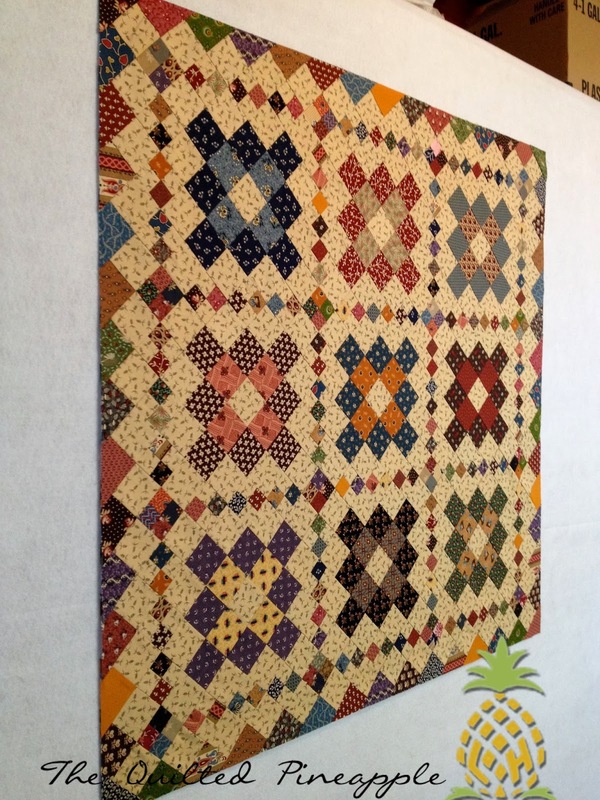 Your Clover Schnibbles quilt is beautiful! I love it. The fabrics are all so pretty. Have a great day! 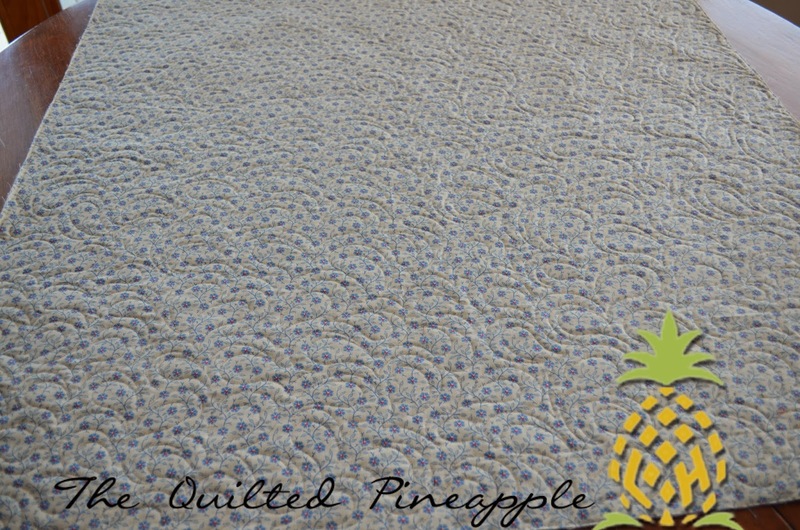 You know if I could pick fabrics as well as you can, I would add reproductions to my stash...you have a magic touch with quilting and a great eye for what you choose in fabrics too! what a beautiful color palette, especially the background. gorgeous! 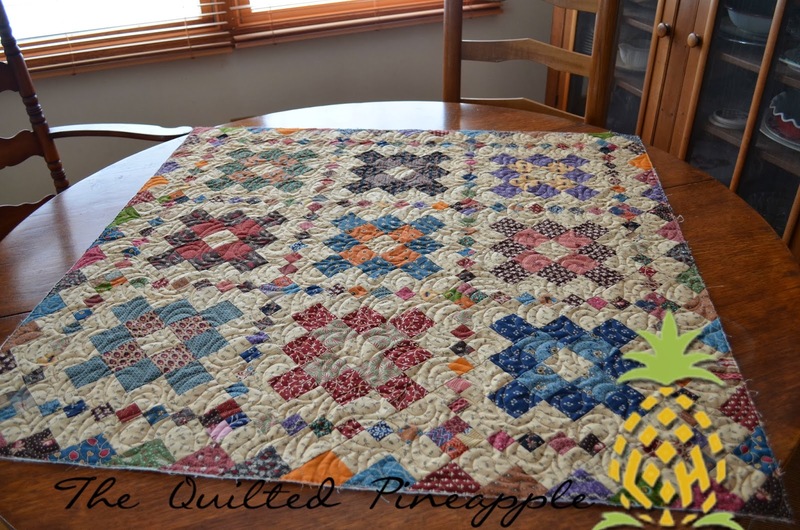 I can only echo the comments above - these colours are just superb together - really homely and warm and traditional - the way I like my quilts. Perfect! xCathy ps giveaway at mine!? It really turned out fabulous. Congrats on getting it finished. Gorgeous! This is a beautiful finish! I LoVe the paisley pattern you quilted it in. The fabrics look amazing ! 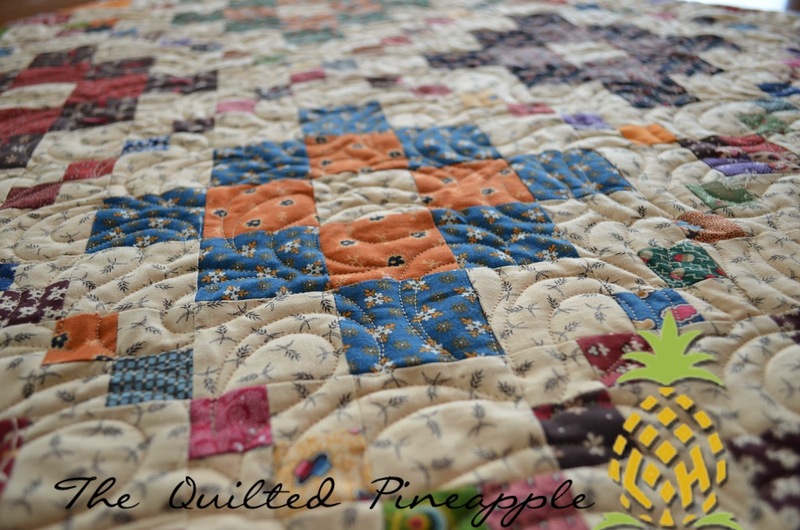 Cheddar is a nice piece of eye candy in a quilt! You will really enjoy the design wall. Oh I love this one! It makes me so happy and feels very springlike to me! The paisley is perfect! I am so happy to have found your Blog! 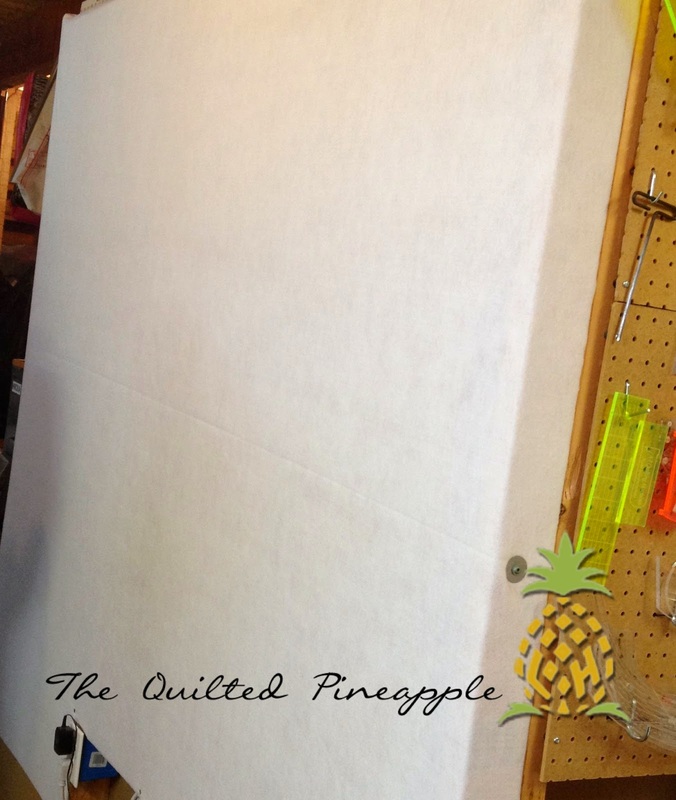 I love your quilting ideas and tutorials. Can you explain how you do a Paisley Feather? I love paisley and often use it in a border, but I can't quite figure out how to do it as a feather. Thanks!